© 1997 by Kathleen Kemsley, first published in Women On Wheels Magazine, January 1998. 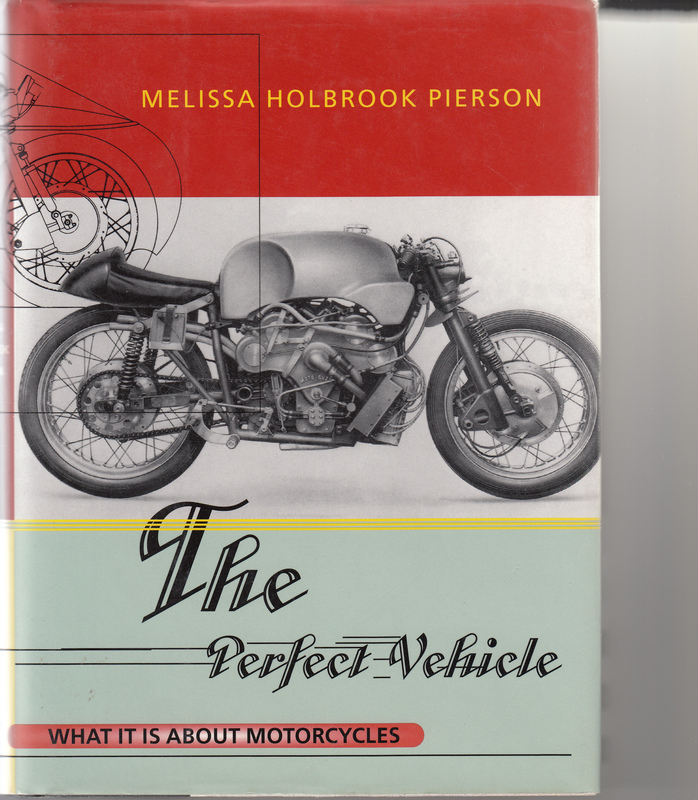 The Perfect Vehicle (W.W. Norton & Company, 1997, $24.00) is a book about motorcycling that defies categorization. It is not a travel book, like Ted Simon’s classic Jupiter’s Travels, although it does contain descriptions of the author’s rides on the Blue Ridge Parkway, the New Jersey Turnpike, and in several European countries. And while the book covers the history of motorcycle racing and women who ride, it is not a historical document of the Hear Me Roar breed. Perhaps the closest comparison to this book is Robert Pirsig’s part-philosophy, part-travelogue classic, Zen and the Art of Motorcycle Maintenance. But The Perfect Vehicle resists fitting neatly into any particular genre of motorcycling books; it must be read to be understood. The author, a Brooklyn woman who is married to a non-riding man, owns a white Moto-Guzzi Lario. Like most Moto-Guzzi owners, she is completely in love with the somewhat quirky Italian model, although her comments about other motorcycle brands are surprisingly complimentary. She got started on Moto-Guzzis the way many of us women were attracted to our first motorcycle: her boyfriend rode one. Out of necessity, Pierson makes friends with men who can work on the Guzzi, which breaks down frequently. Eventually, she learns how to do most of the repairs herself. Pierson rides for the first several years with groups of men or with a boyfriend. Finally, after what seemed to me to take way too long, she signs up for a women-only riding class and discovers the sisterhood among women who ride. She also gradually gets up the courage to ride solo, relishing the alone time on her bike, where there may be “people all around, in a car in the next lane not five feet away, but they can’t get you…You are spared the burden of words.” Her reflections about the combination of giddy freedom and abject fear inspired by these solo rides struck a chord with me. To her credit, Pierson does not shy away from examining the dangers of riding motorcycles. Though she has never herself been in a serious accident, the fear of an accident or a mechanical breakdown is never far from the forefront of her mind. “Danger is really the wind that passes on either side of a motorcycle,” she writes. “You may go for long periods of time without feeling it, hours and days and weeks of nothing but routine and happy riding, then it chooses one minute to remind you not to forget it’s there… Sometimes motorcyclists themselves try to deny it, as they do when they wear shorts or bare heads, as if a specially assigned guardian angel drew an impenetrable shield around them. Or they claim never to have felt fear, only joy; they can certainly get testy, some of them, if you mention the word, as if saying it brings it on. But somewhere, they all know it. And they know it is in part why they do it; the mastery of danger, or the feeling of it.”: As someone who has experienced the pain and terror of a serious motorcycle wreck, and yet couldn’t wait to get back on the bike and ride again, I appreciated Pierson’s unflinching examination of the fears that go hand-in-hand with the joys for riding a motorcycle. The Perfect Vehicle would have perhaps benefitted from an index, or at least from chapter titles which summarized the subject of each. The book jumps around, describing the visual and mechanical appeal of a Moto-Guzzi on one page and leaping into the details of a group ride in Belgium on the next. But then, if I had known precisely where to turn to read about the history of women riding long-distance, I might have skipped over some of the most lyrical and interesting passages in the book. Unlike several other motorcycling books, such as The Investment Biker by Jim Rogers, Pierson includes the personal, and sometimes embarrassing, details of her life. I did not have to wonder, for example, why her relationship with Franz, a Moto-Guzzi shop owner, broke up. She writes of her own inner landscape, complete with inconsistencies and irrational fears, as easily as she chronicles the history of the Moto-Guzzi Company. This willingness to open her heart for examination by everyone who reads her book is admirable. With Jim Rogers, we never get a clue what kind of mood he was in when he crossed Siberia. With Melissa Pierson, the moods she describes provide the window into understanding why she loves to ride.